Bella Venezia is a reflection on the idealised beauty of an ancient city that has survived a colourful and turbulent history into the present day, and highlights the juxtaposition of the inevitable watery decay and deterioration associated with a relentless tourism industry . 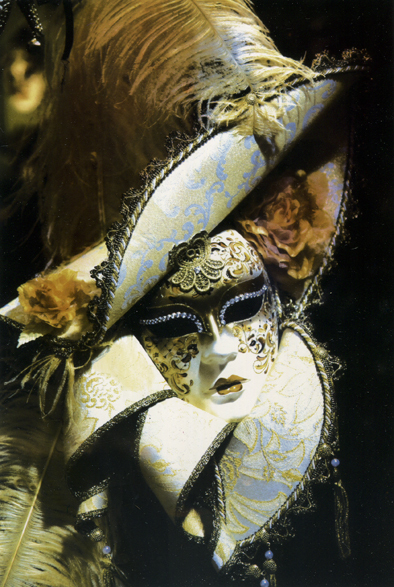 Iconic and romanticised objects of Venice, such as the centuries old tradition of Venetian masks are featured, conjuring up images of the beautifully lit canals with gondoliers and marbled arched bridges, representing the mystery of old Venice. It is also a reflection on the ongoing decay of time and the modern day wear and tear, represented through the street graffiti covering many of the old and beautifully intricate buildings, the result of a tourism industry that sees over 20 million visitors a year. The unique, four colour carbon transfer hand crafted images reflect a city trapped in both the past and the present, and under siege from multiple forces of decay. Like an old majestic queen with her tarnished crown, she is still standing, with the pride of memories of what she once was.